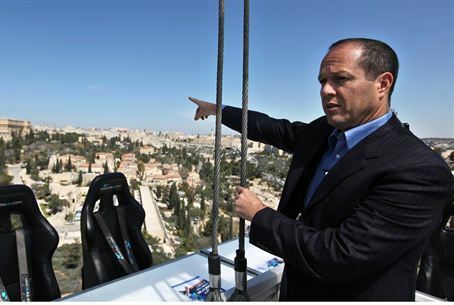 Jerusalem Mayor Nir Barkat: “We need to connect the E1 area to Jerusalem without any reservations at all." Jerusalem Mayor Nir Barkat expressed support on Monday for the Israeli government’s plan to build 3,000 additional housing units in the E1 section between Jerusalem and Maaleh Adumim, Israel Hayom reported. Barkat said he was surprised by the overtly negative and hostile reaction of European countries, including Britain, France, Sweden, Denmark and Spain, summoned the Israeli ambassadors in their respective capitals to protest the plans. “When the world talks about a freeze in Jerusalem, I ask, a freeze on what? On the billions we invest in east Jerusalem? Should we stop construction for Arabs, Christians or Jews? Or does someone mean that when an entrepreneur approaches me, I should, heaven forbid, ask him what religion he subscribes to so he can receive a permit to build in Jerusalem? That would be horrendous and it negates even U.S. law,” he said. On Tuesday, government secretary Tzvi Hauser responded to the international criticism, saying that the government of Israel remains committed to Jewish interests in Jerusalem. “If someone thinks that Israel will avoid building in neighborhoods in its capital city due to reprimands or pressure, that person does not fully grasp Israel’s interests in the region,” he told Kol Yisrael radio. “We are not talking about a little stone in the desert. We are talking about Jerusalem," he added. Prime Minister Binyamin Netanyahu has affirmed that Israel will not back down due to international pressure. "We continue to insist on our vital interests, even under international pressure…There will be no change in the decision that has been made,” a source in the Prime Minister’s Office said earlier this week.